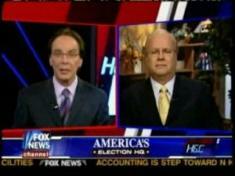 Rove Defends McCain's Lobbyist Friends By Saying Obama Has Them Too...yea, Right! Rove tries to defend McCain's lobbyist pals on H&C with his typical "Obama has them too," routine. Colmes does a good job of pointing out the fact that McCain used to be a maverick when it came to lobbyists, but not anymore. And he didn't forget about naming Rick Davis either. Colmes: You have John McCain come out hard against Russia, his chief foreign policy advisor got lobbyists money. John McCain has talked about not taking lobbyist money and being a different kind of candidate back when he was a maverick. And then now he has all these lobbyists working for him. I wouldn't get in there and start throwing mud at McCain over lobbyists associations without then realizing what kind of lobbyist associations there are among Democrats, particularly among congressional Democrats.